Wood ear mushrooms (Auricularia auricula) don't seem to be as popular in North America as other wild mushrooms, probably in no small part due to their lackluster flavor. However, wood ears do possess an interesting quality that makes them quite useful when cooking — they have an almost crunchy texture. If you've ever eat slices of raw clam, these mushrooms feel similarly between the teeth, somewhere between a rubbery quality and the crispness of fresh vegetables. I like to use them in tandem with more flavorful mushrooms, layering in different qualities to the resulting dishes. Or, like with this salad composed of oranges and avocados, they act as bread-less crouton, adding snap to a recipe needing an additional textural component. Here, I am lucky enough to be able to forage these ephemeral mushrooms on downed conifers in the mountains in late summer monsoon season. They are always a delightful find because, as their name indicates, they indeed closely resemble ears, so much so that one can hardly resist the urge to hold one up to their head take zombie ear portraits. 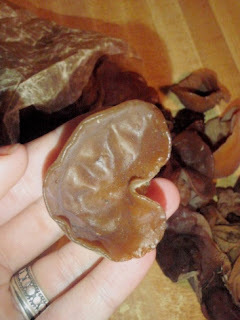 If you aren't fortunate enough to harvest your own wood ear mushrooms, they are fairly easy to find and inexpensive, both fresh and dried, in the Asian grocery store. This is a specific salad. 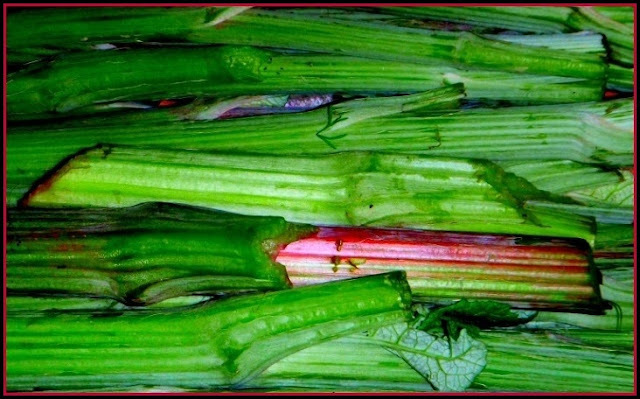 Every ingredient counts, and they come together in a nearly magical way. Salads are so easy in summertime, when one can effortlessly combine whatever fresh ingredients are around. In winter, I find myself struggling more to make salads that are aren't the same old, and feel relevant to the season, serving to lighten up long-cooked and heavy winter fare. 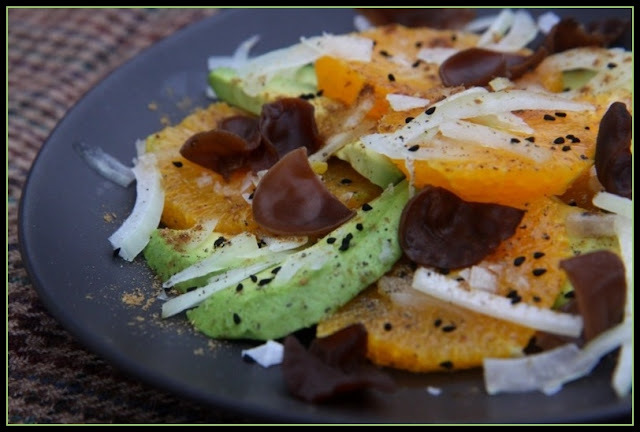 This salad is a mashup of two recipes — orange slices, onion, and cumin, served to me by a friend at a casual lunch, and the avocado, orange, and green onion salad from Around the World in 120 Salads. The addition of the wood ear mushrooms is my own. I recommend that you seek out the nigella seeds. You are most likely to find them at an Asian market. 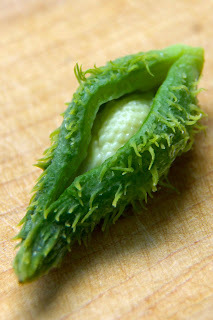 They have a flavor somewhat like a splice of oregano and onion, with the crunch of sesame seeds. Learn more about identifying wood ear mushrooms here. 1. Begin by re-hydrating the wood ear mushrooms by placing them into a small bowl, covering them with boiling water, and letting them sit for 5 minutes. After they have plumped, drain the water. 2. Meanwhile, peel the orange and slice it into 1/2" rounds, reserving any fallen juices. 3. Peel and de-pit the avocado, then carefully slice it into 1/2" pieces, lengthwise. 4. Compose the salad by alternating slices of avocado and orange in the shape of a wheel. Sprinkle the slivered onions over the fruit, then place the wood ear mushrooms about. 5. Season the dish with the cumin, nigella seeds, salt, and pepper. 6. Finally, drizzle the salad with any remaining orange juice, and the olive oil. Serve immediately.